The ancient technique of ply-split braiding offers contemporary designs to knitters, weavers and basket makers. However, unlike the techniques of these fiber arts, in ply-split braiding one cord passes through others. Pattern is created by the order in which the cords are split and the color arrangement of the cords. Necklaces, baskets, purse and bag handles, clothing accessories, pet collars ... the possibilities are limitless, and it is something that can be done anywhere with little equipment. Please see our Ply-Split Braiding Photo Gallery for some of Louise’s recent art. We also offer PSB Information with videos, tutorials, and advice on getting started with your own ply-splitting. And, of course, see our Sales page for gripfids and cordmaking tools, books, and cotton cords. Handweaving has been a passion for Louise for more than 35 years and remains a central part of her life. Her work currently focuses on painted silk scarves, rep weave wall hangings and table runners, and versatile kitchen towels. These are not currently available for sale online, but are offered at select events in Minnesota each year. For some examples of her work see the Weaving Photo Gallery. 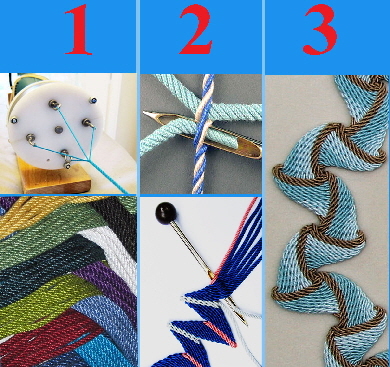 Louise offers her popular Instructions for Warping a Loom Back-to-Front without charge. See our Mobile Website for Ply-split Braiding supplies on your cell phone. You are ready to ply-split! There are many more possibilities from key fobs to fashion accessories to baskets to functional bands. Browse our website for much more information. Ply-Split Braiding gripfids, cords, cord makers, books.